This last year for Christmas, I put a “Mystery Dinner Date Night” in my husband’s stocking as one of his gifts. We finally got around to going out last week and it was such a blast! When we got home and told our boys about it, they all insisted that they should get to go on a mystery dinner date with me, too. Last weekend it worked out that I was home alone with our youngest, Charlie. So he and I went out for our special dinner. I simplified a few things for the kid version of the date night, but it was still a blast! 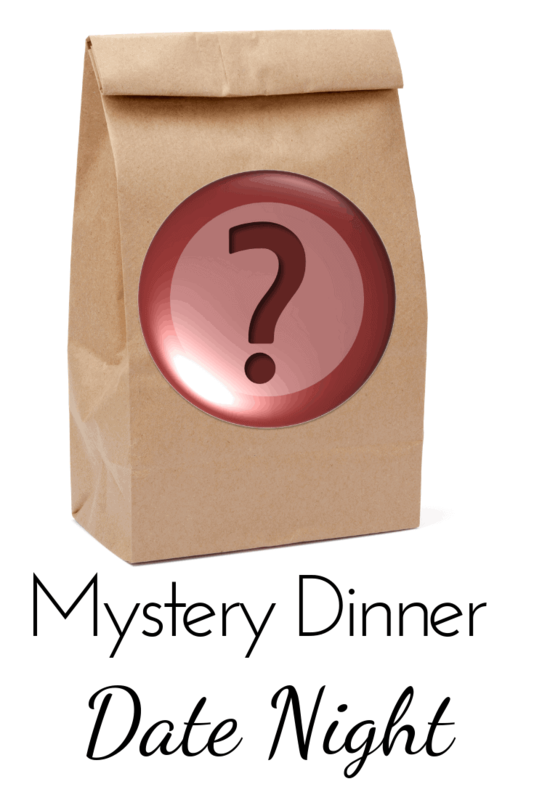 Whether you do this with your spouse or your kids, a mystery dinner is so much fun! This is a date that takes a little bit of planning ahead, but nothing too crazy. For our grown up version we decided on five courses: Soup, Salad, Appetizer, Entree and Dessert. For each course, choose 5-10 places you’d like to go. (If you live in a large city, you may want to keep the choices within a few miles of each other so you don’t end up criss-crossing the town all night.) Write each name down on a separate piece of paper, fold it and put it in a brown paper bag. You will have a total of 5 paper bags with several choices in each one. Here’s the fun twist: for every course, include a “whammy” destination. This is a place that you can technically get food, but it’s not your favorite restaurant. 😉 Our whammy options were Grocery Store, Gas Station, Food Court and Costco. At the beginning of each course, pull from the corresponding bag to find out where you’re going to go! If you want to be really spontaneous, pull the bags blind-you might end up starting with dessert and ending with soup. If you pull a whammy option, you just have to get creative. Somehow, we managed to pull TWO whammies when my husband and I went out! Our soup course was served at the grocery store (good thing Vons has a deli where they serve hot soup) and sadly, the appetizer course ended up being dished up at the gas station. We had a good laugh and saved a little money while we enjoyed cheese sticks and salami in the car. Oh my! This sounds like so much fun! I will, definitely, be doing this!